SMNE’s Organizational Structure is based on the hybrid of Functional Organization and Projectized Organization with some modification to accommodate the need to synchronize relatively permanent functional units (Departments), and those of specific task-oriented term limited voluntary group formations (Task Forces). The term functional organization is used specifically for the purpose of describing a hierarchal group or department, in which it is determined that each individual and particular employee should be charged with the task of defining an individual and unique person who will serve as the organizational leader and/or manager of a given department or functional unit (such as: finance, planning, audit, etc., …) Also, the leader (the Director) of the functional organization should essentially take the entirety of the departments, analyze all of their strengths and weaknesses, group the individual departments (functional units) into programmatic categories based on the aforementioned strengths and weaknesses, and then allocate leaders to tasks that effectively utilize those skills that they may posses. Additionally, an individual who is of particularly advanced qualification in that area should manage each specific functional category. In the long run, and as the technical and financial resources of the organization permit, paid regular staffs would replace all voluntary members of the functional departments. On the other hand, SMNE is a member-driven organization that mainly and regularly depends on free and voluntary participation of its constituents in the overall organizational movement and strategic programs. The participation and contribution of each member is best organized through formulation and coordination of specialized taskforce units with specific mission and task orientation. The timing and duration of each taskforce is dependant upon the accomplishments of its mission, and the change in the strategic and programmatic need of the organization as whole. In attempting to determine exactly how a taskforce fits in to the grand scheme of the SMNE organization and to facilitate the ease of conducting a number of tasks, it is deemed to accommodate that of a projectized approach. 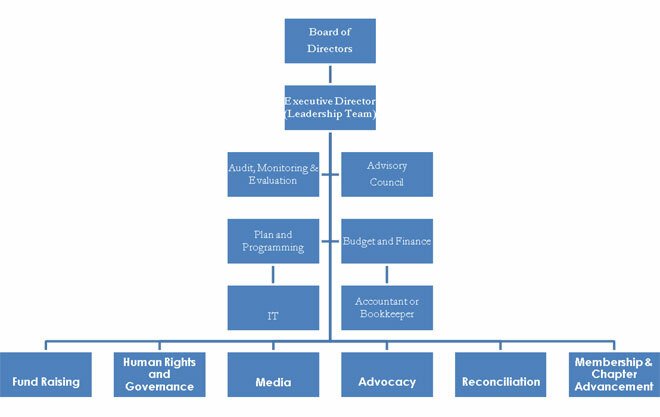 A projectized organization (in SMNE’s case) refers particularly to specific organization built through the incorporation of an organizational structure set up in a manner in which an elected member of a taskforce leads a voluntary group and in which the taskforce leader has the ultimate responsibility to make any and all decisions involving the unit, including, but no necessarily limited to, delegation of the team in the overall program governing body, assignment of all priorities, the application of any pre-designated resources, and also any and all direct workings of persons that have been assigned to the taskforce already or may be assigned in the future. Taskforces can be determined on a rolling basis, and as the organization demands, that is, as organizational development necessitated the reformulation of the task groups, and/or as individuals seek to move to another group, or receive additional training, or education, then they may be reassigned to different taskforces to most effectively utilize the strengths of all members of the taskforce team. The current Taskforce Leadership is based on participation of voluntary members with no delegation. In the future, however, it should be comprised of and elected from a pool of representatives of various regional chapters. Each chapter will delegate/appoint one representative to the International Taskforce Team. The current Plan and Programming Department Head position will be responsible for the coordination and support of the International Taskforce Team. Once a reasonable number of Chapters formed at various geographical locations, elected chapter leaders will take over the highest role of organizational leadership at international level. The executive Director shall take the responsibility of coordinating this International Leadership Team. To this end, the current SMNE leadership is expected to facilitate and execute detailed review and analysis to come up with more defined organizational structural. Assume Legal representation and protection. Resolve internal conflicts between/among taskforces and/or chapters. Conduct online research and assessment activities; for e.g., opinion polls, etc. Maintain enthusiastic environment through occasional and regular celebrative communication: greeting cards, birthdays, thank yous, anniversaries, etc. Design objective, mission, strategy and plan of action of the task force. Investigate, collect, document and analyze information and evidences on human rights abuses, corruption and economic crimes. Prepare educational materials and conduct training, seminars, workshops on human right abuses and anti-corruption and follow up the results. Organize and prepare legal documents on matters of human rights abuses, corruption and economic crimes. Educate the public via different media outlets how to fight corruption and stand up against human rights abuses.